For courses in Basic Mathematics. Math hasn’t changed, but students – and the way they learn – have. 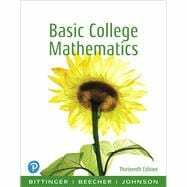 In this revision of the Bittinger Worktext Series, the Bittinger author team brings their extensive experience to developmental math courses, paired with thoughtful integration of technology and content. The Bittinger Series enables students to get the most out of their course through their updated learning path, and new engaging exercises to support various types of student learning. Bittinger offers respected content written by author-educators, tightly integrated with MyLab™ Math – the #1 choice in digital learning. Bringing the authors’ voices and their approach into the MyLab course gives students the motivation, engagement, and skill sets they need to master algebra.